Even dog skeptics might be surprised how deftly Marley & Me adapts newspaper columnist John Grogan's book...into the equivalent of a kid's movie for adults. 116 min. 20th Century Fox Distribution. Director: David Frankel. Cast: Owen Wilson, Jennifer Aniston, Alan Arkin, Eric Dane, Haley Bennett. While watching Marley & Me, dog lovers will feel like their favorite pet when he's lolling his tongues out the window of a moving car. As for the rest of us: you know how your face glazes over when pet owners start telling their stories? Still, even dog skeptics might be surprised how deftly Marley & Me adapts newspaper columnist John Grogan's book Marley & Me: Life and Love with the World's Worst Dog into the equivalent of a kid's movie for adults. Two top writer-directors—Scott Frank (The Lookout) and Don Roos (Happy Endings)—bring their talents to bear on the script, and director David Frankel (The Devil Wears Prada) is no slouch, either. With a PG rating allowing kids to laugh and cry alongside their dog-owning parents, it's no wonder the film was such a smash hit during the holiday season. Owen Wilson plays Grogan, a reporter turned columnist for the Florida Sun-Sentinel. He has a supportive wife in Jennifer (Jennifer Aniston), herself a reporter, and an ambivalent attitude toward his own lifelong tendency to surprise himself: while it helps him convince the Sun-Sentinel's editor (lovingly curmudgeonly Alan Arkin) to hire him, it also keeps him restless. The young Grogan decides to keep at bay his wife's presumably burgeoning maternal instincts by buying her a yellow Labrador retriever for her birthday. As Grogan recounts in voice-over, he had found "the world's worst dog...or so I thought," a comment that sets the stage for a film full of comical disasters but ultimately abiding love and respect for the household pet as a vital member of the family. What ultimately redeems the film above all else is its construction as a meditation on the life not only of a dog but of his human keepers. It's been a while since there's been a mainstream film so interested in the time-spanning tides of a relationship, careers, the individual senses of self of two marrieds, and their identity as a couple. Frank and Roos surprisingly invest themselves into the work even as they explore how Grogan invests himself in his column writing, a career move the self-styled serious reporter had never intended for himself. A mid-film montage propelling the narrative through the years effectively dramatizatizes how Grogan puts himself into his work, and how Marley becomes an inextricable part of the Grogans' lives (including the children that inevitably follow). 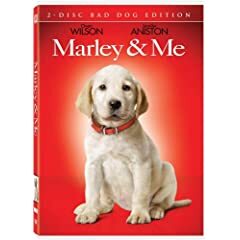 Though millions of people can be wrong at the movies, it would be foolish to underestimate the power of Marley & Me, a film about American life—and Americans' love for pets—that, not for nothing, touched a deep chord. Fox gives Marley & Me a deluxe treatment on Blu-ray and DVD. The pristine and vibrant image and DTS-HD 5.1 Master Lossless Audio deliver an excellent home-viewing experience, and the film gets a fair number of bonus features for those wanting a glimpse behind the scenes. Though there's no audio commentary, the film itself can be enjoyed with a Dog Training Trivia Track offering advice to pet owners. Nineteen "Deleted or Extended Scenes" (25:58, HD) come with optional commentary by director David Frankel. "Finding Marley" (7:48, HD) focuses on the many dogs put on screen, with comments from Frankel and dog trainers Mark Forbes, Mathilde de Cagny, Ray Beal, and Larry Madrid. "Breaking the Golden Rule" (8:02, HD) refers to working with kids and animals. Owen Wilson, Jennifer Aniston, Kathleen Turner, Frankel, Eric Dane, and John Grogan sit for interviews amid behind-the-scenes footage in this brief, promo-style look at the film's making. "On Set with Marley: Dog of All Trades" (2:36, HD) is a silly "interview" for those with good control of their gag reflex: kids and pet owners who dress their dogs up in costumes, I'm guessing. "Animal Adoption" (5:18, HD) does a bit of community service by featuring Dr. Pia Salk of adopt-a-pet.com, Carly Lyn & Simone, and Blue Dog Ranch owner David Roe. A "Gag Reel" (5:40, HD) and "When Not to Pee" (2:17, HD) offer amusing outtakes. Lst but not least, the Blu-ray set includes a bonus DVD version of the film on Disc Two and a Digital Copy on Disc Three, giving families every flexibility on how and where they watch the film. Many a minivan audience will be pleased to hear it! All site content © 2000-2019 Peter Canavese. Page generated at 04/18/2019 12:15:03PM.